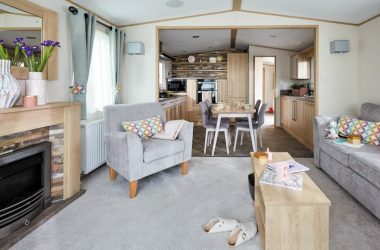 Our largest two-bedroomed caravans are a new design for 2018 (est arrival Feb 2018). With captivating sea views, this is a stunning place to spend your precious holiday time. The décor is superb. 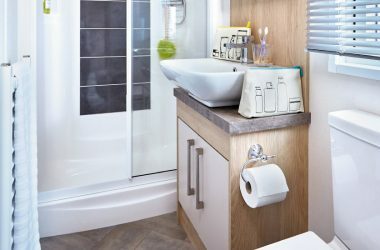 Natural tones and textures give you wonderful contemporary comfort. Good looks combine with exceptional practical features, all designed to give you an easy and relaxing space to stay.The light living area has large windows – just sit back and admire the views. The modern kitchen and dining area is perfect for lively family meals. From the king size bed to the traditional fireplace, the Malham is full of wonderful touches which will make your holiday extra-special. 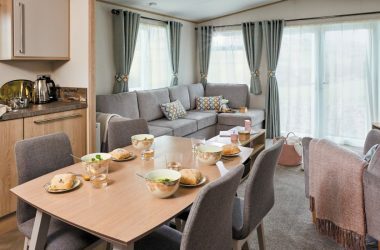 Ayr Holiday Park is so close to the centre of town. Simply park on site and walk into our lovely local town. St Ives has world-class golden beaches, a picturesque fishing harbour, and lovely little winding streets. Just next door to the park is The Garrack Hotel, where you can use the indoor heated swimming pool and sauna (for a small charge). We know that the kitchen in the Malham is fantastic – but take the night off, and book a table at The Garrack’s AA Rosette-awarded restaurant, wonderful staff an food.